Rus project was to result in first major propulsion upgrade to R-7 family in forty years, using first stage engines derived from those developed for Zenit second stage to boost performance. 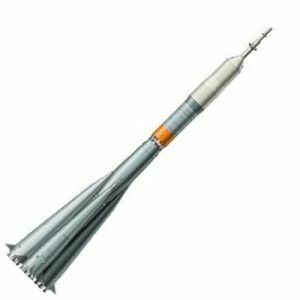 It would have permitted launches from Plesetsk with same or greater payload than launch of standard Soyuz-U from Baikonur, permitting move of more launch operations back onto Russian territory. Instead the more modest Soyuz ST / Soyuz FG upgrades were made. AKA: 11A511M;Rus. Status: Development ended 2000. First Launch: 1971-12-27. Last Launch: 1976-03-31. Number: 8 . Payload: 7,900 kg (17,400 lb). Thrust: 4,334.30 kN (974,389 lbf). Gross mass: 309,180 kg (681,620 lb). Height: 45.00 m (147.00 ft). Diameter: 2.95 m (9.67 ft). Apogee: 200 km (120 mi). LEO Payload: 7,900 kg (17,400 lb) to a 200 km orbit. Payload: 2,900 kg (6,300 lb) to a GTO. Flyaway Unit Cost 1985$: 3.000 million. Stage 0. 4 x Soyuz M-0. Gross Mass: 42,200 kg (93,000 lb). Empty Mass: 3,000 kg (6,600 lb). Thrust (vac): 872.000 kN (196,033 lbf). Isp: 336 sec. Burn time: 145 sec. Isp(sl): 298 sec. Diameter: 2.68 m (8.79 ft). Span: 2.68 m (8.79 ft). Length: 20.00 m (65.00 ft). Propellants: Lox/Kerosene. No Engines: 1. Engine: RD-120K. Status: In production. Stage 1. 1 x Soyuz M-1. Gross Mass: 100,500 kg (221,500 lb). Empty Mass: 6,000 kg (13,200 lb). Thrust (vac): 872.000 kN (196,033 lbf). Isp: 336 sec. Burn time: 310 sec. Isp(sl): 298 sec. Diameter: 2.95 m (9.67 ft). Span: 2.95 m (9.67 ft). Length: 28.00 m (91.00 ft). Propellants: Lox/Kerosene. No Engines: 1. Engine: RD-120K. Status: In production. Stage 3. 1 x Soyuz M-3. Gross Mass: 5,000 kg (11,000 lb). Empty Mass: 1,000 kg (2,200 lb). Thrust (vac): 20.000 kN (4,496 lbf). Isp: 360 sec. Burn time: 700 sec. Diameter: 2.40 m (7.80 ft). Span: 2.40 m (7.80 ft). Length: 2.70 m (8.80 ft). Propellants: Lox/Kerosene. No Engines: 1. Engine: RD-161-1. Status: In production. Comments: Empty mass estimated. Multiple restart engine. Family: orbital launch vehicle. Country: Russia. Engines: RD-0110, RD-0124, RD-161P, RD-120K. Spacecraft: Obzor. Stages: Soyuz M-0, Soyuz M-1, Soyuz M-3, Soyuz 11A511U-2. Agency: Korolev bureau.